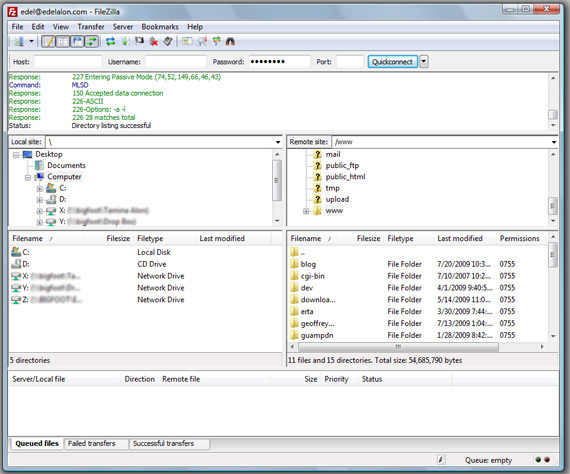 My coworker pointed me to FileZilla since I was looking for a good FTP client for my Vista machine. I just haven’t had time to play with Microsoft’s Command Shell just yet. I’m sure I’ll get to it but for now there’s FileZilla. Oh, the other cool thing is that there is a download for XP, OS X, and Linux. So far so good. It’s definitely easy to configure. The main things to configure are at the top of the window: Host, Username, Password, and Port. One of my pet peeves is that companies that make software for multiple platforms do not make the use interface the same. With FileZilla, the user interface is the same across the board. But here’s the best thing of all, it’s free! Do Search Engines Really Chop And Change Their Algorithms On A Consistent Basis?